The El Laco deposit is an unusual magnetite deposit high in the Andes in Chile. Some consider it to be a volcanogenic extrusive massive magnetite flow. But many others consider it to be an alteration deposit, some sort of high level skarn-like alteration of a precursor andesite. In 2000 I collected some 60 samples from the El Laco deposit for baro-acoustic decrepitation analyses for comparison with many other Fe oxide deposit types. The decrepitation data suggests the presence of fluid systems in the formation of these deposits. 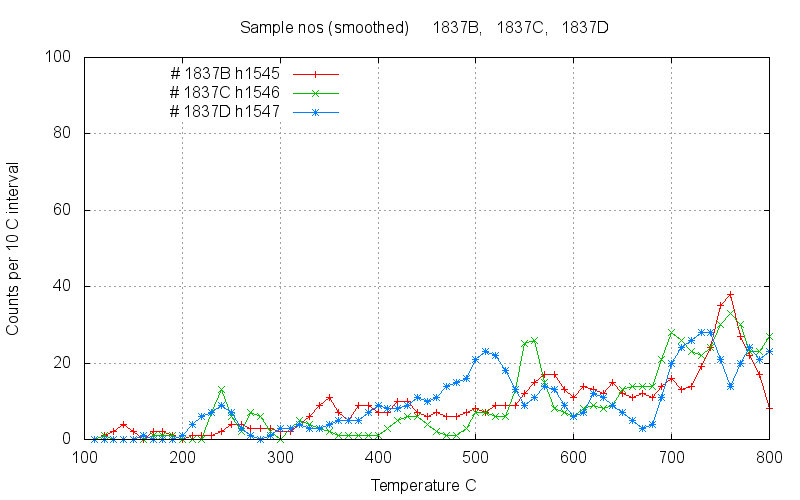 These fluids were only of low density and give only low intensity broad decrepitation at high temperatures. 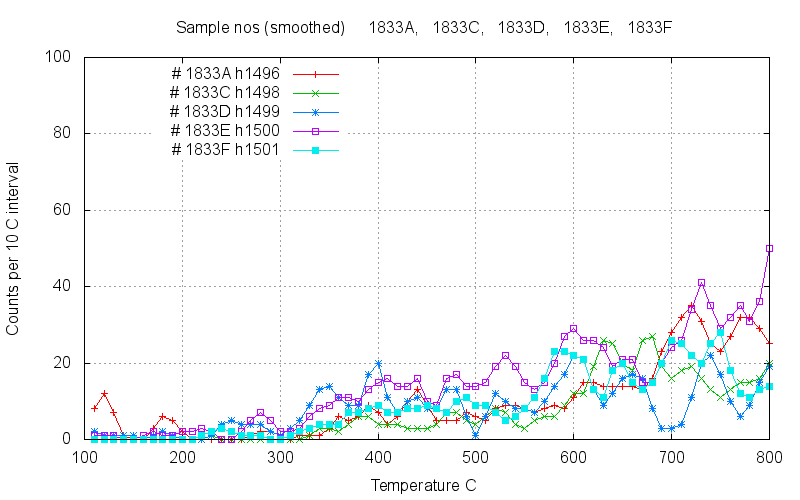 The low density fluids cannot be used to infer an ore deposit formation temperature based on this baro-acoustic decrepitation data. The El Laco deposits were probably NOT formed from a magmatic oxide melt extrusive, as this would not contain any fluids to form the fluid inclusions widely observed in this data. This data is consistent with and supports the Sillitoe model (see below) of steam-alteration of a precursor andesite at very shallow levels for the origin of these deposits. This location and geology map is from Francisco Velasco and Fernando Tornos. R. Sillitoe published a paper in Economic Geology vol. 97 no. 5, pages 1101-1109 in 2002. This quote is from the abstract of that paper. "The El Laco magnetite deposit has been interpreted as lava flows and feeder dikes formed from iron oxide magma, but more recently, as a product of metasomatic replacement. Open-pit exposure created at Laco Sur during the 1990s reveals that the massive magnetite contains magnetite-veined blocks and smaller fragments of altered andesitic volcanic rock, clearly supporting the replacement origin. Open-space growth of magnetite and pyroxene along the walls of chimney structures and veins within magnetite indicates precipitation from aqueous fluid, rather than from gas alone. 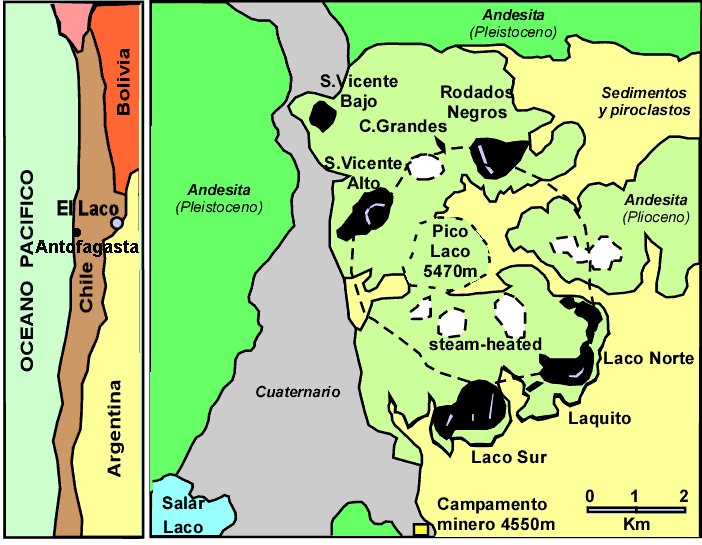 The native sulfur-bearing, cristobalite-alunite alteration widespread at El Laco, and broadly contemporaneous with magnetite formation, is recognized as part of a steam-heated horizon generated in the vadose zone above a paleowater table. Consequently, the magnetite replacement must have taken place beneath the paleowater table, but probably <300 m beneath the paleosurface." The competing volcanogenic model for this deposit is discussed by Nystroem and Henriquez in Economic Geology, Vol 89, No. 4, pages 820-839, 1994. and also in this conference abstract. Although I only spent 4 hours at the mine, my own observations convinced me that this was an altered andesite rather than a magmatic oxide-melt extrusive. Five separate locations were sampled from existing open mine faces and also from surface outcrop in other areas. At each location multiple samples were collected within a radius of a few metres and each was analysed separately. This sampling procedure provides information on both local and distal variability within the deposit. The sample description summaries are here. In the laboratory, the samples were magnetically separated. When there was enough sample of both magnetic and non-magnetic fractions, both fractions were analysed separately. The primary focus of the study was on the magnetic fraction of the samples but some samples only contained haematite. All analyses were carried out on 1.5 gram samples (instead of the normal 0.5 grams) for better sensitivity on these low level decrepitation samples. All results are of the magnetic fraction, unless otherwise stated. Sample 1833 was collected from the main active ore mining area at El Laco Sur, from the lowest bench. 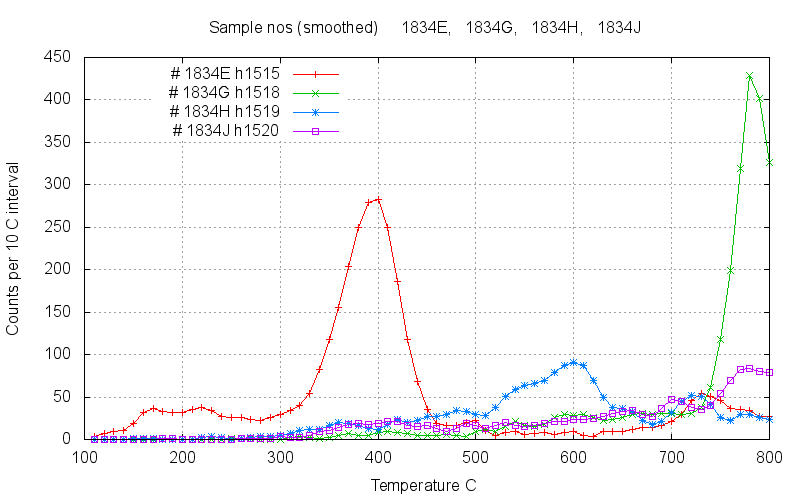 Sample 1833 magnetics show very little or no significant decrepitation, suggesting an absence of liquid phase fluid inclusions. 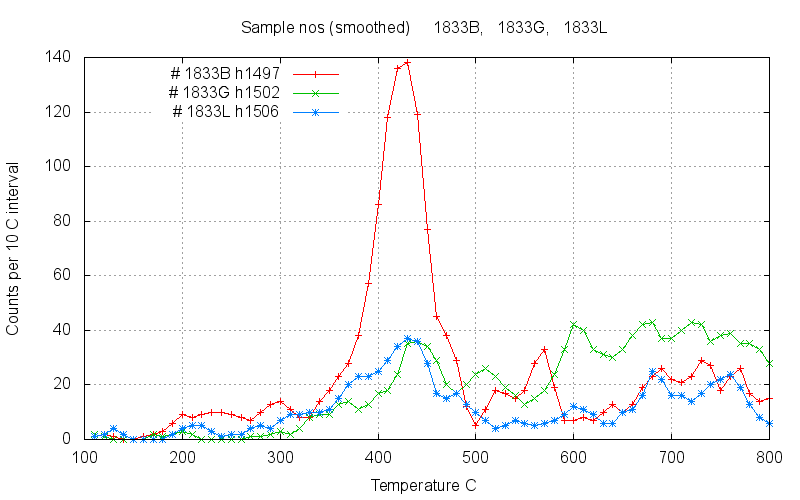 Sample 1833 B has a prominent and unusual peak at 430C and samples 1833G, J and L show a weaker peak at this temperature. Perhaps this is due fluid inclusions in a minor (contaminant?) mineral phase other than magnetite. The non-magnetic sample 1833N has a small peak at 600 C which is due to inclusions in quartz or silica. These non-magnetic samples (haematitic) show slightly elevated decrepitation from 600 to 800 C. This haematite must be of primary origin rather than secondary, as weathering of magnetite would have destroyed the fluid inclusions. 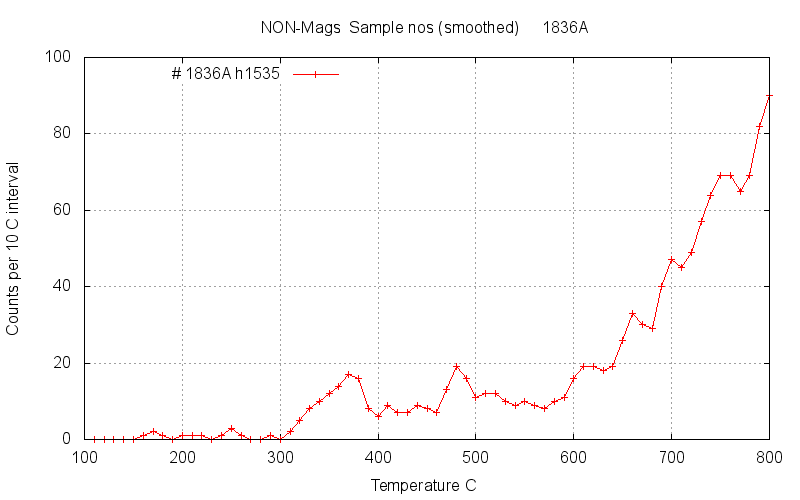 Sample 1834 magnetics usually had only low intensity decrepitation typical of just background but with elevated results over a broad temperature interval in 1834A. 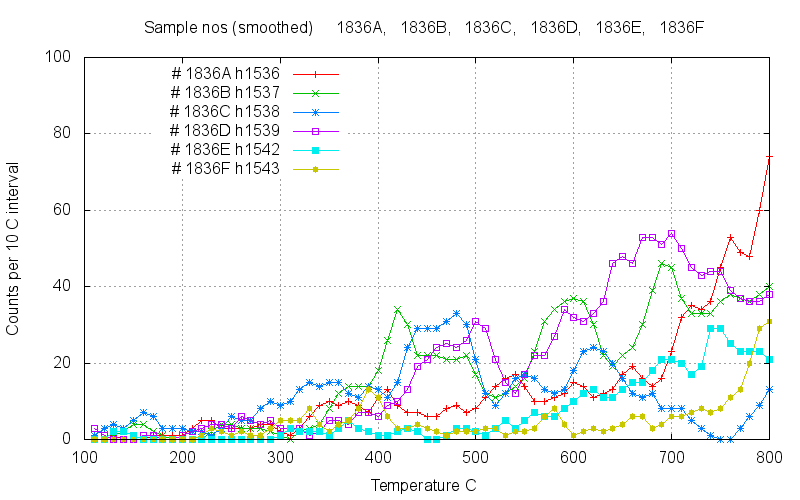 Sample 1834E shows a prominent peak at 400 C similar to that seen in 1833B G and L, perhaps due to another mineral phase. 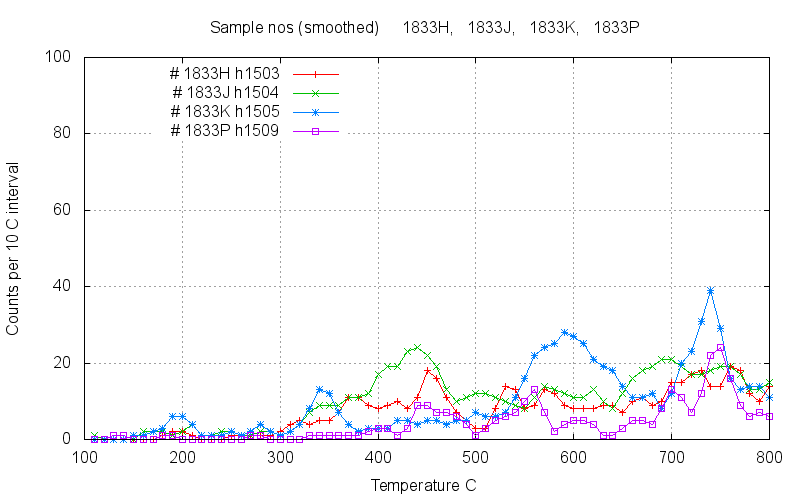 The small peak at 600 C in 1834H is probably due to inclusions within silicification. The significant peak at 780 in 1834G indicates the presence of fluid inclusions, although perhaps only small or of low density. Although the mineral formation temperature cannot be inferred from this peak we can infer that deposition occurred from an aqueous fluid phase of some sort. Sample 1835 was from the uppermost level of the El Laco Sur workings, originally excavated in 1917. Sample 1835 shows substantial decrepitation for 3 of the sub-samples, indicating the presence of fluid inclusions. These are probably only small and/or of low density and suggest that mineral deposition occurred from an aqueous phase. These samples are of haematite with almost no magnetite. Sample 1836 is from outcrop on a ridge to the North East of the workings. There were no workings here. Sample 1836 shows weak decrepitation over a broad temperature range, with a possible inclusion population near 460 C shown on 3 samples. 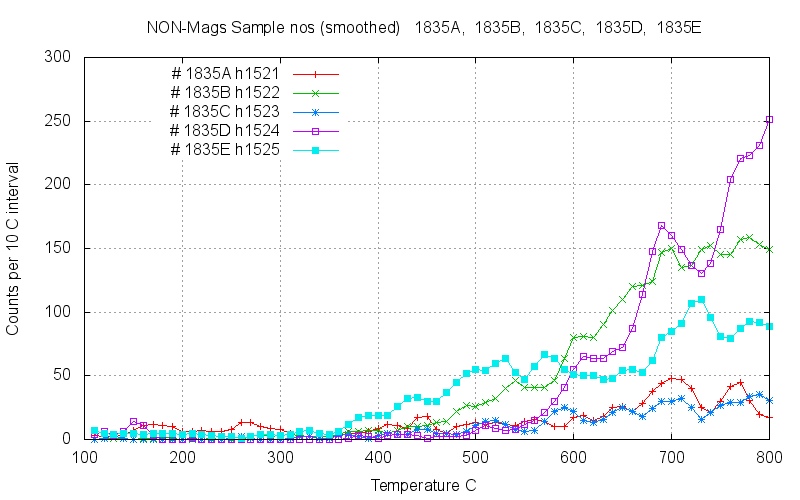 Most samples, including the non-magnetic 1836A show elevated decrepitation near 800 C indicative of some fluid action during deposition. Sample 1837 is from outcrop on a ridge to the North West of the workings. There were no workings here. 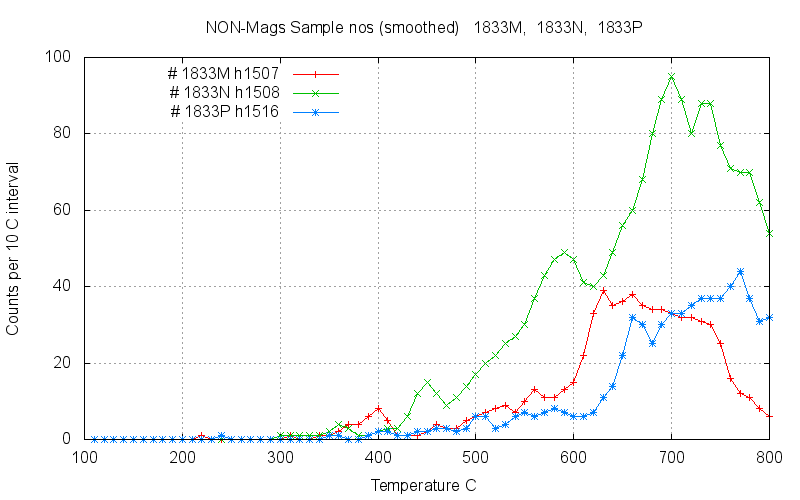 Sample 1837 magnetics shows only background levels of decrepitation. 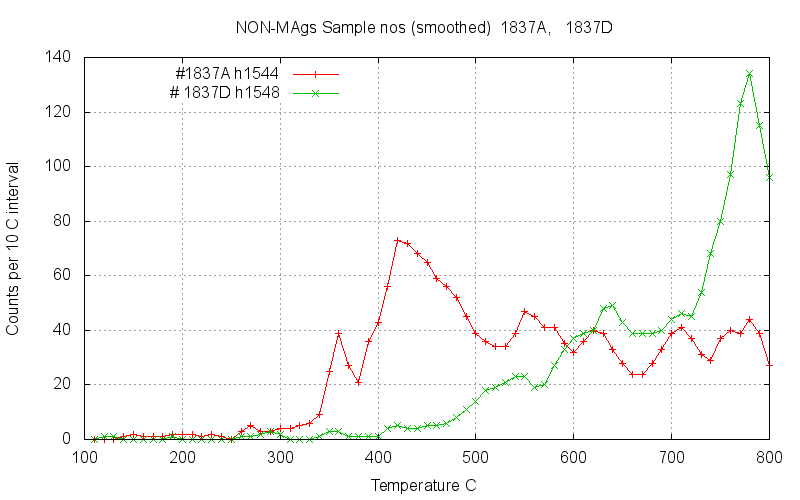 Sample 1837 non-magnetics shows prominent decrepitation at 400 C on 1837A and prominent high temperature decrepitation on 1837D. These results again suggest the involvement of fluids during mineral formation of the haematite. Samples were also collected from the Cristales Grandes and the San Vincente Alto areas, but these were not analysed. An Overview of various FeOxide systems, mostly North America. Only low levels of decrepitation were observed on the samples from El Laco. But many samples, both of magnetite and haematite, show elevated decrepitation in a broad temperature interval from 600 to 800 C. This does indicate that fluid processes, rather than a dry magma, were involved in the formation of this deposit. However, the low levels of decrepitation are unusual and indicate that the inclusions are either unusually small or contain only fluids of low density, such as steam or high level epithermal fluids. Such low density fluids do not build up very high pressures when heated and only inclusions near grain boundaries or fracture planes will decrepitate. The El Laco deposits were probably not formed from a magmatic oxide melt extrusive, as this would not contain any fluids to form fluid inclusions as observed in this data. The lack of intense decrepitation indicates that the fluids involved in the deposition were probably of very low density. This data is consistent with the Sillitoe model (see above) of steam-alteration of a precursor andesite at very shallow levels for the origin of these deposits.